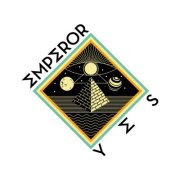 Kaleidoscopic experimental pop merchants Emperor Yes return with the follow-up to their debut single this week, with 'Cosmos'. They've roped in friend and Summer Camp man, Jeremy Warmsley, as producer and backing vocalist - developing a sound that veers between prog and stadium pop. Listen to the new single below. "We're young and curious" is repeated often throughout 'Cosmos' - a reflection of Emperor Yes' quest for experimental pop perfection. They don't quite match the brilliance of their debut single 'Fishes'/'Wasps' here but their ambition is smile-inducing. To celebrate the release of the single on Tape Club Records, the band have also put together an art exhibition related to 'Cosmos'. If you're in the Brick Lane area of London between 14th and 24th March, then it might well be worth your time to pop in. Find more info at facebook.com/emperoryes.